For a while now, I’ve been hinting about a project I’ve been working on that I wanted to show you soon. And Soon has finally arrived! Yay! I’ve been working on a collection of “smalls.” Smalls are little pieces of embroidery or other needlework that usually get finished into (small) things. I’ve called this collection of four smalls A Thousand Flowers. It’s a group of four tapestry smalls featuring animals set in a floral background, all as a nod to my favorite pieces of textile art that we chatted about the other day. The title A Thousand Flowers hails from the French mille fleur. The mille-fleur backgrounds of medieval tapestries are delightful! And they don’t belong solely to the medieval age. Check out tapestries from the Arts & Crafts era, and you will find that Morris and his contemporaries, leaning toward medieval themes, incorporated this same background approach in their own textile art. A different stylization, perhaps, but no less abundantly floral! My first approach to these tapestry smalls was to decide on a size. With the enchanting plethora of embroidered jewelry trending these days, I found the idea of a jewelry bezel setting quite fetching! To that end, I picked a common size – 32mm, or 1.25″ in diameter. It’s not too big to be cumbersome, but not so small as to be indistinguishable. I used the bezels that I wrote about here to finish some of the smalls. To fit the size and still get in enough detail, I experimented with different gauges of silk gauze, finally settling on 48 count (48 holes per inch). The nice thing about jewelry bezels is that they can be used not only as jewelry, but as ornaments (add a hanger rather than a chain), key fobs, and as other small-use settings. My animals – which began as a rabbit, dog, cat, squirrel, deer, unicorn, and poor attempt at a monkey – are more modern than medieval. Perhaps they’re for the animal lover of today, more than for the cartoonist of 700 years ago? I think they are. Besides working as inserts for jewelry bezels, the finished designs can be made into… well, anything! Anything that you can make out of a small, round, stitched thing! I like them as scissor fobs. I like them as little Christmas ornaments! They can be mounted onto covered buttons and made into multiple items, like one of these scissor-pull lanyards. Glue a strong magnet to the back, and make yourself a needle minder. Make a little pin keep! This is why I love small things! Once your imagination gets going, you can discover all kinds of uses for little pieces of stitchery. I settled on four tapestry smalls altogether. A bunny was essential, as they are quite prolific on medieval tapestries. I happen to love squirrels, so they made the cut. And then, of course, we had to have representatives of the cat and dog families, because what would life be, without them? I stitched three of them (all but the squirrels) on 48 count silk gauze, and I didn’t limit myself in color choices when preparing the projects. There are 15 colors of silk in each small. 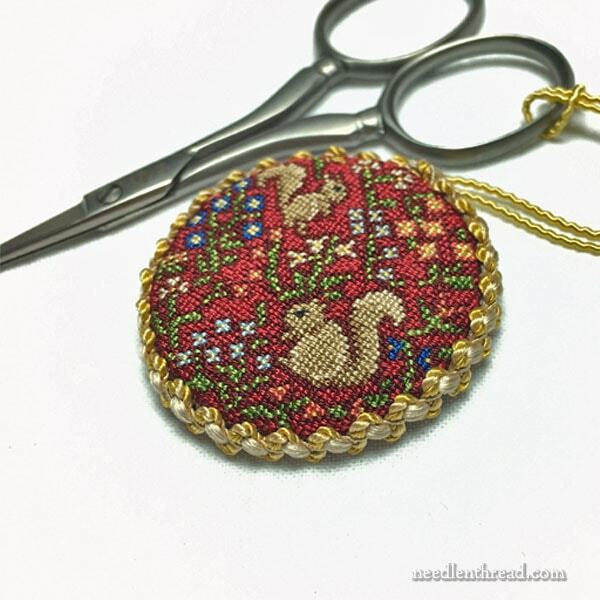 I decided to try the squirrels on 40 count silk gauze, which produces a 1.5″ small – perfect for ornaments, fobs and the like, but not as common for jewelry bezels. And of course, they can be stitched on lower count gauze. They can also be worked in cross stitch on even-weave linen. I personally wouldn’t go lower than, say, 32 count linen stitched over one thread, in order to keep the pixelation a little less pronounced. The lower the count of linen (or the larger the x’s) in cross stitch, the more pixelated the final outcome of the piece. But on 32 count or higher, the smalls could be finished into larger ornaments, pin keeps, and other doodads. There’s plenty of room for experimentation in size and finishing techniques with charted designs like this! The charts for all four designs will come out in one instructional ebook very soon for those who want to join me in stitching up a menagerie of tapestry smalls. The ebook also features stitching and finishing tips. I’ll also be releasing a very limited number of materials kits, featuring full spools of all the silk – enough for a whole zoo of smalls! – along with 48 count silk gauze, and the appropriate needles. It’s a nice, compact kit, and a great way to gather the supplies from one spot in one handy little package. There’s a tiny bonus gift in each package, too – but that’s a discussion for another day. I’ve had so much fun putting these kits together! So, that’s what I’ve been up to! Lots of sample stitching, writing, photographing, finishing, photographing, writing, cutting fabric, sorting silk, packaging, photographing, writing – it keeps me busy and out of trouble. I’ll be writing a bit about putting together kits, for those who are interested in the process, have questions, or have contemplated doing something similar. There are certainly pros and cons to kitting up materials, and I think there’s a lot of room for a good conversation about the whole process, the advantages and disadvantages of kitting, and the future of embroidery kits on the designer level. In fact, it’s too big a conversation for one article, but I’ll start the ball rolling, so we can all enjoy a good discussing and get decent feedback from the wider community. What do you think? I’m open to questions, comments, suggestions – anything you want to know about, or anything you think I should know about? Feel free to join in the conversation below! March 11, 2019 Finishing Idea for Tapestry Smalls: Pocket Watch – & Kits in Stock! As I began reading the post, I thought to myself, I should suggest that she prepare kits for this, because I want to do it and I know I won’t gather the materials. And lo! you have kits! I can’t wait to buy one!!! 🙂 Great minds thing alike, Sarah! LOL! Gotta try this. These minis are heart tugging wonderful. I have done quite a bit of needlepoint but never counted stitch. Never anything so darned precious. Hard to imagine I still have the dexterity but I am determined to try. You made my day. Eager for the kits. I’m ready! I’d just like to say that I love the smalls and I want to preorder the complete kit if possible. I can’t wait to try stitching them. These are simply beautiful and the kit will be very helpful. May I order one? How utterly delightful!!! I am so pleased that you have made kits for these, because I could probably never source all the supplies. I love the designs – beautiful work, Mary! Oh, I’m so excited for this!!! I’m also in love with that style of textile art, both medieval and Morris -style, and recently I’ve been itching to try a project on silk gauze. I can’t wait to see if I’m able to snag one of the kits! Thank you for presenting us with another beautiful project Mary! Love these Mary!!! Well done. Kitting is a great idea because there are many readers out there with no place to buy stitching supplies, especially silk gauze and threads. Mary, I love these smalls and am a pretty decent embroiderer. However, I have never done any counted work. Would these be appropriate for a beginner in counted work? Will the book have instruction on how to go airboat counted work, if not will you suggest a good book for a beginner? They’re lovely! Yes, I’m thinking of putting them on a crazy quilt. Hi, Sarah – they might be a bit challenging for an absolute beginner. The ebook assumes basic knowledge of counted work, but it gives tips. I’m sure there are books out there for counted needlepoint or counted petit point – definitely for counted cross stitch, and the concepts are basically the same. The fabric structure is a little different and the tent stitch is used instead of cross stitch. I don’t have a specific recommendation though – I’ll look into it! I love the idea of a well put together kit especially by someone who actually makes the ideas they sell as a kit. It can be just plain hard to locate supplies depending where you live. I am looking forward to when they are available and price. Thank you for all your sharing of great and interesting articles and advise you share with us. Your needlework excitement is indeed infectious! I’ve always wanted to try silk gauze (and silk thread) so hopefully I can get one of the kits when they’re released! These tiny works are truly treasures! I look forward to seeing the charts and kits when they are available. I agree that kits are essential as the suggested materials are not easily available to some of us. I am supposed to be paying attention to the speaker at a meeting … but this post was too tough to resist reading – love the idea of the kits, Mary ! I also would love to purchase a kit/kits. I am so excited, as usual your work is breathtaking. The unicorn would be a wonderful addition to your menagerie. Thank you. Yes, to the kit of smalls! I’ve been so enjoying your emails and inspired to return to embroidery – and have a couple of ufo’s on the go! These are delightful! And I agree with Sarah, a kit would be ever so useful, and spur me on to complete them before my eyesight goes entirely! Greetings Mary: I am very interested in the kits, I do hope I can get in on one. I love that they are done in such a small stitch. I am excited for you and your new book. I’m very interested in purchasing the kits but not till after the first of the years after Christmas expenses. I love these kits as scissors fobs. Thanks Mary keep posting. Lovely!! And kits are especially great when trying something new, because you can buy just the amount of supplies you need without investing in a full array of materials. I have yet to embroider with silk, and would love to know why you chose it for this project. I’m sure there are some disadvantages to kits for some. I love embroidering and yet never feel creative enough to create my own designs. I even struggle with color selection when I start from a pattern without a picture. I’m just not naturally creative or artistic, but I love to stitch beautiful things. Kind of sad really. Looking forward to seeing these kits available. The jewelry items or mini frames or compacts as you have recommended before. Look forward to the kit release. Love, love, LOVE! I was a miniaturist in a former life I’m certain. When will the kits be available please? Hi, Susan – look for the availability announcement here on Needle ‘n Thread (www.needlenthread.com) on Friday, November 23rd, right around 7:00 am central time. That’s when I’ll be launching them! I’m so excited about these little animals! I had just ordered a copper brooch frame from Nunn Designs & was contemplating what to put in it. You just solved my dilemma. Looking forward to the release. I’ve been stitching Christmas projects since June- it’ll be fun to make something for myself when this last project is finally finished. Hi, Sandie – look for the availability announcement here on Needle ‘n Thread (www.needlenthread.com) on Friday, November 23rd, right around 7:00 am central time. That’s when I’ll be launching them! Oh Mary these “smalls” are just wonderful! I am definitely ordering a kit. Kits are great for me. I live in northern Alberta and we don’t have any choices of threads other than DMC floss and DMC pearl cotton. So we have to order on line to get the silks and other threads. It can get very costly. I have found that purchasing a kit is more economical. You can see Exactly what the directions refer to, rather than guessing with a substitute thread. I find the projects do not look as “pretty” with substitute threads. Thanks for putting all this together! I know it is a lot of work. You are doing a fantastic job. Your the best! Thanks, Brenda! look for the availability announcement here on Needle ‘n Thread (www.needlenthread.com) on Friday, November 23rd, right around 7:00 am central time. That’s when I’ll be launching them! Hi, Theresa – thanks! look for the availability announcement here on Needle ‘n Thread (www.needlenthread.com) on Friday, November 23rd, right around 7:00 am central time. That’s when I’ll be launching them! They are beautiful. Can you let me know when the kits are available? Hi, Amy – look for the availability announcement here on Needle ‘n Thread (www.needlenthread.com) on Friday, November 23rd, right around 7:00 am central time. That’s when I’ll be launching them! Absolutely love these! The smallest I have stitched is 40ct so I look forward to trying 48ct. These are so sweet. I love that you’ve taken the bezels to a new height! I’ve often thought about something like this but, you’ve actually done it. That’s why we love you , Mary; you do it and then share it with all of us! Dear Mary, I love these Mille fiori designs! I would happily buy kits, but if it is too problematic or expensive to ship them from the US, I hope you will also sell them as pattern books from your online shop. Yes, I will, Sue! They’ll both launch the same day (kit and e-book download). Hi, Charlotte – look for the availability announcement here on Needle ‘n Thread (www.needlenthread.com) on Friday, November 23rd, right around 7:00 am central time. That’s when I’ll be launching them! Wonderful designs–love them–definitely want a kit. OMG! These are adorable! Always luved the Unicorn tapestries, I think you really caught their feel here. My eyes do not do fine gauge so well anymore but may have to try these. Appreciate having the options for smaller thread counts too. Regarding kits: complete, and high quality materials. To me, the whole point of a kit is that everything is there and top of the line. It makes it ready to go (immediately able to scratch the itch 🙂 ) and I don’t have to hunt all over for the supplies. This can be particularly challenging, and even more expensive, if it is something hard to find. So can I put this on the Christmas list for the hubby :)??? Thanks, Catherine! Of course you can! 🙂 I’ll be releasing them the day after Thanksgiving, so keep an eye out! I find silk gauze easier to stitch on than, say, linen of the same count. The holes are easier to see, especially if you have a darker background behind where you’re holding your work. And if you use magnification, the 48 count isn’t bad! Mary these are FANTASTIC! I can’t wait to see the ebook! I’m also very curious to see where the conversation about kits, preparing kits and the future of designer kits goes. For the moment I’m off to see what I have in my stash of small, round findings and ‘plot and plan’ for some silk gauze stitching! I want a kit! These are adorable! My favorite is the squirrels! How beautiful! I will have to try something like this (perhaps in free form since I’m not disciplined enough to do counted work). Thank you! And they are such charming and lovely projects! The little animals are wonderful (by which I mean “wonder-ful” — little woodland fantasies)! Can’t wait for the kits to come out, because I LOVE kits — someone else has done the hard work of hunting and gathering! Am also very interested in your thoughts on putting kits together. Will you be addressing kits for children (seems like a possibility, given the embroidery classes you ran last summer)? I’ve often thought of putting together kits as gifts for my grandchildren — commercial kits for crafts for kids are so limited (especially if you’re looking for something that’s NOT pink, purple, and princessy) — but am not sure how to go about it. Hello from South Africa! Mary, they are absolutely stunning. Well done! I’ve hooked a large wall hanging of the lady and the unicorn and am busy with another canvas needle tapestry. But yours just take my breath away! Thanks for all the information that you give us, and your enthusiasm. Hi, Lynn – They take me about 10-12 hours to stitch and finish one. Even though they are so small, they do pack in quite a few stitches. So it takes more time to finish something like this, at this size, compared to stitching, for example, surface embroidery confined to this size space. I love these designs and I have an idea of using one to cover an old Victorian stool which is about 8-9 ” in diameter. Do you think it is far fetched to enlarge this pattern to fit my stool? Hmmm…..I don’t think the designs would enlarge well enough to that size. For a 9″ circle, there would be only about 6-7 stitches per inch, which would make the individual stitches huge and would result in a very pixelated design. I have routinely stitched on 40 count over one. These are intriguing designs. I love you are doing cross stitch. Mary, I absolutely fell I love st 8 am this morning and it was with your Thousand Fliwers design. I’ve been a fan of the Clint tapestries for decades and have stitched various versions through the years. But none so exquisite as these. I’m so excited that you are venturing into the kitting arena since our ability to source these types of threads and materials is limited here. But to find that your first kit will be for my favorite of all designs is wonderful. So I hope to be able to purchase your kit and I will definitely be purchasing your ebook. Now if my eyes can just handle the gauze count. Lol. Congratulations on the beginning of what I know will be a successful venture. I can hardly wait! I hope you prepared enough kits!!! I have never done anything like this before. What an adventure!! Thanks, Roseann! Wellll…. I hope I did, too! I think I did. I hope I didn’t over-estimate, which more of the worry when making this kind of investment! :-/ If there aren’t enough and it seems like there will be a demand, I’ll think about doing another batch. We’ll just have to see! It looks like you’re having a good time, Mary! Thanks for all your great inspiration! Putting kits together is fun! For me, finishing those WIPs that are laying around is more likely to happen if I put the WIP and all its supplies together in a tote as a kit. Then I can just pick up the tote and start working without having to round up all the parts. Since I have collections of scissors, needles and hoops, etc., EVERYTHING needed to work on the project can go into its kit. Gathering the things together also reminds me how much I like the project and gets me excited to work on it again. Same with me, Marty! I always pre-gather when I start something, putting the supplies in something – either a box, or a bag or a tray – to keep them together and easily accessible. Hi, Carol! I’m glad you like them! The kits & the e-book will launch the day after Thanksgiving (so, a week from Friday)! Everything’s practically ready – just a few more little adjustments to make to ensure that everything goes smoothly. Note to self: Get up early next Friday! This is brilliant. I can’t wait for the kits to be available. These are absolutely beautiful!!! I’m so excited about seeing this beautiful part of history come to life!! Please let me know how I may reserve a kit!! The kits and the ebook are going to be available the day after Thanksgiving. I can’t take reservations for the kits – it will have to be on a first come, first serve basis. If there’s a demand for them, I’ll consider doing another batch, too. It really just depends. It’s a huge investment to do kits like these, so I have to be a little cautious. I would dearly love to try this! I’m a little intimidated by the 48 count as I’ve never ventured so small, but they look sooooooo darling! Sign me up! Hi, Beth – Have you stitched on silk gauze? It’s much easier to stitch on a higher count silk gauze, in my opinion, than it is to stitch on a higher count fabric, like linen). It’s easier to see the open holes in the gauze! I’m glad you like it! I wish you were, too! I could use the extra hands!!! LOL! Look for the availability announcement on Friday, November 23rd, right around 7:00 am central time. That’s when I’ll be launching them! Hi, Nancy – look for them Friday, November 23rd, right around 7:00 am central time. That’s when I’ll be launching them! I would love to receive the instructions and kit for the Thousand Flowers-Four Small Rounds. Hi, Collette – look for them Friday, November 23rd, right around 7:00 am central time here on Needle ‘n Thread. That’s when I’ll be launching them! Now I know what I’ll be doing the day after Thanksgiving. Sitting at my computer waiting to pounce on the “Buy” icon! So beautiful and useful. Thanks, Mary. Hi, Georgia – look for them Friday, November 23rd, right around 7:00 am central time. That’s when I’ll be launching them! I love when I can get a kit with exactly the materials I need. Especially when its something like silk which is harder to come by or when its something new and I just want to try it. thanks so much for all your information. LOVE your blog. I’ll hopefully be first in line when the kits come out. Hi, Cyndy – look for them Friday, November 23rd, right around 7:00 am central time. That’s when I’ll be launching them! I love these! Hope I can afford the kit! Hi, Maura – look for them Friday, November 23rd, right around 7:00 am central time. That’s when I’ll be launching them! I don’t think I’ve ever been so excited as when I read of this morning’s post of the kit for smalls! I would love to be able to purchase a kit! Hi, Cheryl – look for them Friday, November 23rd, right around 7:00 am central time. That’s when I’ll be launching them! I am very excited for the kits to become available for purchase! Thank you Mary! Hi, Carol – look for them Friday, November 23rd, right around 7:00 am central time. That’s when I’ll be launching them! Those are wonderful! So original and colourful…hopefully I’ll be one of the lucky ones to get in on the limited release – that kind of kit us right up my alley. Hi, Sherri – Well, look for them Friday, November 23rd, right around 7:00 am central time. That’s when I’ll be launching them! I know what I want for Christmas! I was hoping for kits and here they are! Eeeeee these are so wonderful! I love the idea of kits from you. You are so very helpful in all things needle. I find I prefer kits because I am not sure when I might start and finish a prodject. Items may not be available when I get around to actually stitching. I am also pleased that you have started TINY. I love working tiny. Put me on the list. Hi, Cynthia! Thanks for your comment! The kits and the ebook (separately) will be released on Friday morning, November 23rd, probably around 7:00 am central time. I’m afraid I can’t do pre-orders or reservations. It’s a matter of first-come. 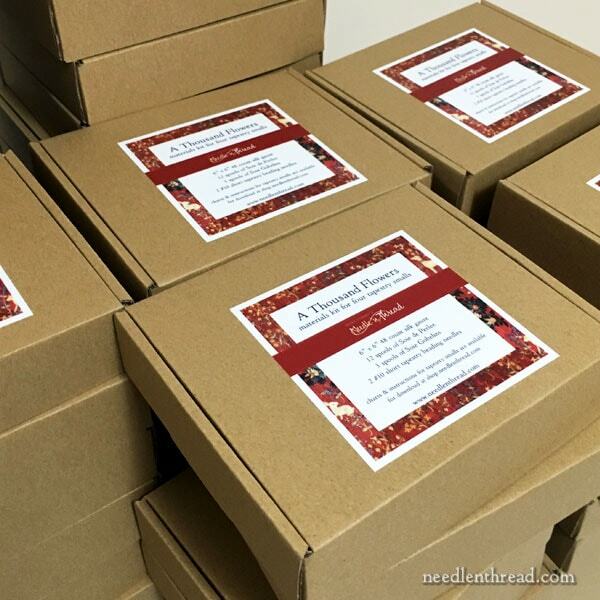 If there’s demand and my first batch of kits runs out, I’ll probably do another small batch – we will see! OH they are so gorgeous! I would just love to stitch them! I do hope you will send to Scotland! can’t wait. so glad you kitted them up. I have to order on line and,or drive 2and a half hours to a shop that does not carry everything. the designs are great. thank you. I would love to be on your list to get the 4 kits. They are fabulous, just love them. Hi, Joy – They’ll be released on Friday morning, November 23rd, probably around 7:00 am central time. I’m afraid I can’t do pre-orders or reservations. It’s a matter of first-come. If there’s demand and my first batch runs out, I’ll probably do another small batch, but we will see! Oooh I love these. I think I’ll be ordering the ebook at least, if not the kits. I love the Cluny tapestries too and keep looking for patterns for them. I’ve found them on Heaven and Earth Designs, but they are big – even on silk gauze! I can’t wait for this ebook! The designs are wonderful and I look forward to stitching something small and beautiful. Thanks for all you do to keep us excited about stitching – not that we need any help with that obsession. Mary, I would love to order one of your kits! I have not embroidered with silk before, and I’m wondering whether you think this project would be a good place to start? And if so, would you ship to Canada? Hi, Annie – this would be more a question of whether or not you’re familiar with stitching on silk gauze, following a chart, since this is counted work and not regular surface embroidery. You should definitely know how to follow a chart. The silk is similar to working with stranded cotton, but it’s a little more fiddly, because it does tend to catch on rough skin. But once you get used to working with it, it’s just as easy to work with as regular stranded cotton. Concerning shipping to Canada, I will ship to Canada, but it is somewhat expensive. There’s just no way around the expense to internationally. I always think shipping to Canada should be about the same as shipping domestically, but unfortunately, it isn’t the case! Fabulous!! How early do I have to get up on the Friday-after-Thanksgiving?!? Funny, Bobbi! 🙂 Since this one will require all the ducks lined up in a row at the moment publishing, it will probably launch right around 7:00 am (central time)! I’m all in. This is just fabulous. Think it will require my magnifying glass and light tho. I can’t wait for these beautiful kits or e-book to be made available to purchase especially the kits as you say they would make lovely ornaments or scissor fobs or hanging Christmas decorations. I haven’t attempted cross stitch in a long while and would be lovely to embroider these. Thanks for sharing your latest projects with us and for the photos and for the up and coming kits and e-books can’t wait. Darn it to heck! You make adorable little doodads in cross-stitch, which I have never done before since I dislike that pixelated look, but you make it all charming and sweet and now I’m gonna be cross-stitching. Then! The pretty little boxes! Full of pretty little kits! And I am going to desperately need one! Why? Because! The little dog would be such a sweet ornament (the cat, too) because it is my puppy’s first Christmas! And she doesn’t even know what it is, but she is already super excited about it. (Once, I got a piece of junk mail and gave it to her saying, “Rosie! You got your first piece of junk mail! Yay!!! We’re going to have to put it through the shredder! Yay!! !” And she walked around with it in her mouth just wagging and wagging her tail for 20 minutes or so. Therefore, I sincerely doubt Christmas will be disappointing.) But! Aside from all that… I still need a kit! Gosh darn it all! I’m terrible at putting projects together. Terrible! “No, this brown won’t do! I need that other brown! Where did this lilac come from? Oh… a limited edition floss pack…” I doubt that I could ever make a kit, let alone write down directions. I do appreciate people that do these things very much. With a tip of the hat, thank you all! LOL! Thanks for your enthusiasm, Whitney! The smaller you go, the less pixelated the look, right? Now, just as long as your puppy doesn’t walk around with the ornament in his mouth for 20 minutes or so…! Love the idea, can’t wait to see the varieties! Oh my God! I want a kit! Please reserve one for me, please! Hi, Sylvie – I’ll be releasing both the kit and the e-book (separately) on Friday, November 23rd, probably around 7:00 am central time. There’s only a limited number of kits at this time, but if there’s interest, I’ll probably do another small batch, depending on the demand. Hi Mary – these are exquisite! What a great beginning project on silk gauze before tackling a larger piece. Do you have a target date when these will be up for sale? I would love to get a couple for Yule presents for fellow stitchers if they are ready in time. Hi, Cyndi – I’ll be releasing the kits and the e-book (separately) on Friday, November 23rd. The number of kits at first is somewhat limited, so you might keep an eye out for the launch article that morning. I’ll most likely schedule it for 7:00 am central time, assuming there are no strange last minute hiccups! I love kits–embroidery kits, cross-stitch, quilt kits. They allow me to create things that I might not otherwise because the initial or overall investment is too large for what I want to do and to sample/practice things that I am not sure I would like to do much of. I also like that I can re-create something someone else has done that I really like and get the exact look or close to it. Kits actually feed my creativity by allowing me to work directly with a project and then use that skill or knowledge elsewhere later. I very much appreciate artists who provide kits, especially given the extra work they might involve. I am so excited, have been since your post on the threads. I have one of these kits, please!please!please! Hi, Anna-Maria! I can’t do pre-orders, I’m afraid. I have a personal policy of only selling exactly what I have on hand. The supply chain in the needlework world can sometimes be a little uncertain, and I would never want to take people’s money unless I could deliver the goods right away. I’ll be releasing a limited amount of kits (and the e-book) a week from Friday (November 23rd), the day after Thanksgiving. Depending on demand, I may do more down the road. One of the threads is not in stock at the supplier at the moment – I cleaned them out. But they’ve got it on order, so hopefully, it’ll come in sooner rather than later, and I could at least do another small batch if there’s a demand for more. Adorable smalls! Very interested in the kit. I love these, are they available? They’ll be available on Friday, November 23rd, Laurie. I’ll announce the release here on the website – probably around 7:00 am central time. So one kit with everything I need to complete the project is a very attractive solution for my particular set of circumstances! I love these and I’m so glad you are making some kits available! I have to order all of my supplies online and I usually end up ordering from several different places when I’m beginning a new project. I’ll definitely buy the kit when it’s available. Ooh, yes please. I’d love a little kit like this. Yes!! I love these. I already stitched a Mille Fleur sampler on silk gauze, and would love to make companion pieces. It’s “so easy” to see the holes on silk gauze compared to linen. I’m afraid shipping would be prohibitive for a kit to be sent to France, but Au Ver à Soie is only a 40 mn bus ride from my place if I do not find the material in my stash. So I’ll only need the ebook next Friday. 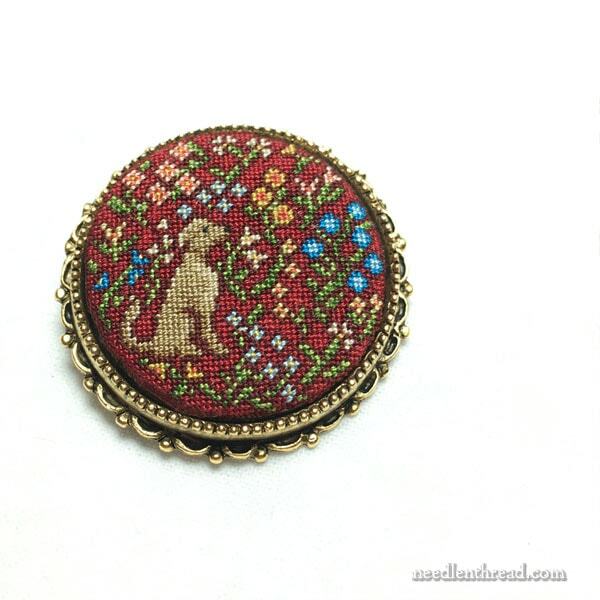 Woohoo – these are beautiful – little embroidered brooches I see, I would love a kit of these. Are you happy to post to NZ Mary ? I can post to NZ, Louise, but I’m cringing at the postal costs. I think they’d have to go global priority. It’s a bit pricy! Still trying to settle some shipping decisions. These smalls are absolutely delightful and I’ll be looking for the e-book to become available. I’m pretty sure my budget wouldn’t allow me to purchase a kit but it does allow me to build my own a bit at a time. There is an excellent embroidery shop available to me just 20 minutes drive away, ‘Threadneedle Street’. I don’t think I’d be able to use the silk gauze anyway as the count is just too small for me to see with any accuracy but that just means there’s one more kit available to those who can use it. I predict these will disappear in a flash going to your excited followers. The animals you chose are just so cute but what about the animals that didn’t make the cut into your chosen four? Were they so bad they couldn’t be included, I wouldn’t mind seeing them so we could understand why they were not chosen. Maybe as part of a post on the creation of this project. Excited to see kits are available as there are no local brick & mortar stores in the vicinity and I’d want to start stitching as soon as the kits arrive. So fun, so nicely detailed, so reminiscent of a small taken out of a medieval tapestry. I also appreciate you included a cat, which I’ve never seen on the Cluny tapestries. These are darling! I may have to indulge despite trying hard not to do too much stash enhancement this year. Tiny count and silk is enough to make me shake my resolve. these kits look adorable and would like to order at least one….what will the cost be per kit? Thank you and keep up the wonderful web page. look for the availability announcement for the kits and instructions ebook on Friday, Nov 23, around 7:00 am central time on the home page here on Needle ‘n Thread. I’m still crunching the price point – trying to keep it as affordable as possible! These are wonderful. Will be watching for your announcement about the kits! I hope that I will be able to purchase one of the kits. I expect them to go quickly. The smalls are well done. When will the kits be available? Hi, Kim – look for the availability announcement for the kits and instructions ebook on Friday, Nov 23, around 7:00 am central time on the home page here on Needle ‘n Thread. I just love these little animal tapestries well done!!!! would love to read all about how you put the kits together . Love kits takes the worry out of picking colours and you have everything to finish. Completely enchanting! I am putting in my bid for the kits….i hope the information comes up soon as to price etc. Hi, Kathejean – look for the availability announcement for the kits and instructions ebook on Friday, Nov 23, around 7:00 am central time on the home page here on Needle ‘n Thread. I vvery much would like to order one of these kits. Are they available for purchase? Did I miss one of your emails. Can you help me on this. I love, love, love these pieces!!!! Hi Mary, love your Smalls and am interested in taking one of your kits. I do a lot of kits, especially from Inspirations. Overall I do like kits especially when it’s a new challenge. I also like to take small projects along when I travel. When we are away and I don’t have any hand work with me, I will buy a kit because it’s convenient. I haven’t been disappointed yet. I myself won’t do them, as I already need a magnifier with a 32 ct. fabric, but I’m highly interested in your promised series on the process of kitting! I love to embroider as well as to make miniatures for shadow boxes and doll houses so these speak to me on many levels. Can I reserve a kit???? These are lovely! I do so love millefleur…but I have actually never tried counted work, nor, obviously, worked on silk gauze. For that matter, in all my decades of surface embroidery, I have ever ordered only one kit: a Trish Burr flower. I have certainly used iron on stamps and have traced patterns from books and “Inspirations,” but I also just create my own designs, or use bits and pieces of designs to work out my own. In fact even with iron ons and tracings, I invariably alter things a bit. All this to say, I am both intrigued and daunted to consider a counted project…it seems a manageable size…and am actually glad to have a week to ponder whether to challenge my spontaneity to attain something so charming! Hmmmm…glad the design will be available in your shop even if I dont yet dare to pounce on the kit. Either way…they are eye candy for sure! How beautiful, please please please kit these as I would love to do them. Please keep me posted. Hi, Linda – look for the availability announcement for the kits and instructions ebook on Friday, Nov 23, around 7:00 am central time on the home page here on Needle ‘n Thread. I’ve never stitched on silk gauze but read a bit here and there. I have a small piece of 40 count that came in a cross stitch “strawberry” pinkeep kit. Have I attempted it? No. It seems like it would be easy since it uses a tent stitch, not a full x. It’s like nothing I’ve ever worked with before. I have a great magnifier/light although it seems to get in the way but will probably be necessary to use it. I love the trim used on the one photo-will that come with it? With something new and uncommon (to me) I like the idea of a kit. It’s a pain to gather all the supplies. It will be interesting to follow. Hi, Sandra – the materials kit includes gauze, silks, and needles. It does not include trim for finishing, since there are so many different ways to finish things like this. The instructional ebook covers tips for finishing and basic instructions, but leaves it open for you to choose how you want to finish the smalls. I want a kit! I think they are very pretty! Count me in when you have the kits ready. Hi, Debbie! look for the availability announcement for the kits and instructions ebook on Friday, Nov 23, around 7:00 am central time on the home page here on Needle ‘n Thread. I am excited to see your new project. I would love to try it. Perhaps I will be that daring :). Let me know when the kits are ready. Hi, Miriam – look for the availability announcement for the kits and instructions ebook on Friday, Nov 23, around 7:00 am central time on the home page here on Needle ‘n Thread. I think the kits are a wonderful idea. I don’t think my LNS has silk glaze and they probably don’t have the silks either. Put me down first on the list! I love these Smalls and am thrilled you put them up as kits. I check my emails several times a day to see your latest post. This one just blew me away! I shall be watching on Friday when they come on line . That’s a pet peeve of mine – I’m not fond of kits that run short of thread. This kit has full spools of silk, so there’s enough to make twice as many smalls – or to experiment with other sizes of silk gauze, and so forth. So, plenty of thread! As for the occasional mistake, they’re inevitable, in a way. They’re certainly never intentional! As long as you have access to the designer, you should be able to sort out any foibles in instructions. So I don’t usually fuss over finding a mistake, but I really don’t like running short of thread! Aha, the gorgeous silks you displayed and just in time to make end of year gifts. When are you going to release orders for the kits- and how much will they cost? As always you have excited the stitching world with your ideas. There are many of us in Australia who live your work- you are our go to person when any of us need more info. Will it be possible to change the colours? Thank you soooo much for your beautiful stitching. Nov 23rd, the availability announcement will be posted on Needle ‘n Thread around 7:00 am (central time) with links to the product listings in the shop. The materials kit and the instructional ebook with charts will be offered separately, especially for those who live outside the US and don’t want to pay shipping on the kit, and for those who have stash they can pull from and don’t need the materials, and, I guess, for those who want to change the colors! What do I think? Well I think I know what the dogs and cats will be giving me for Christmas! These are wonderful and I sure hope I’m lucky enough to grab a kit when offered! Lovely idea. I am enthralled with the smalls, and would love to have all four kits. How ironic that as I was wondering if you would be offering kits, I continued reading and found out that you are. Great idea Mary. Hi, Carol! The kit is for all four at a time – with plenty of thread to do twice as many! Can’t wait to order a kit: I love smalls, Morris type patterns and animals! Please make up plenty of kits! Every time you show or list a website of something that I excel in, cross-stitch, it sells out before I even get a peek at it. So disheartening! I must have these smalls, as they are absolutely charming! I have the utmost trouble sourcing materials. Make up the number of kits you have in mind, then add ONE more for me! Hi, Barbara – Look for the availability announcement for the kits and the instructional ebook (separately) on November 23 around 7:00 am central here on Needle ‘n Thread. I really love these and would definitely like to try my hand with a kit. They’re just beautiful. Thanks, Wendy! Look for the availability announcement for the kits and the instructional ebook (separately) on November 23 around 7:00 am central here on Needle ‘n Thread. what can I say? Your work is beyond exquisite, and in an era of so much that is disposable, your work warms me to the bone. I so respect you. My wish is to start my life over again, so I can produce items like you do. But, gee, I have never even heard of 45 here in America. I am going blind trying to do 25. I do not even understand how you find the time. I’ve been thinking of silk gauze recently! Please let me know when kits are available. Hi, Andrea – Look for the availability announcement for the kits and the instructional ebook (separately) on November 23 around 7:00 am central here on Needle ‘n Thread. I love this idea and am looking forward to trying my hand with 46ct. I could kit, I certainly have enough silks/floss, I would have to purchase the gauge however. But, to try it out in kit form sounds like a lovely and enticing idea. Looking forward to when this is offered. Thank you! Hi, Judy – Look for the availability announcement for the kits and the instructional ebook (separately) on November 23 around 7:00 am central here on Needle ‘n Thread! Love these! Mary, prepare to be overwhelmed with demand for “a very limited number of materials kits,” You may need set up a lottery system. 🙂 It’ll actually just be first-come until they sell out. If there’s enough interest, though, I may run another batch. I love these patterns! I would definitely purchase one if these kits for the four ornaments, but I would want 32 count fabric to make ornaments. I can’t see anything above that count without a real struggle. I would assume that full skeins of thread with 32 count fabric would be enough thread for the four ornaments. Please consider this idea! Hi, Sharon – you can certainly substitute the fabric you prefer. Yes, the kit has full spools of silk, so enough to work all four smalls (and then some) on 48ct. I haven’t worked them on 32 ct, so I can’t estimate how far the thread will go on that count. Hi, Karen – Look for the availability announcement for the kits and the instructional ebook (separately) on November 23 around 7:00 am central here on Needle ‘n Thread. You made my day. Eager for the kits. I’m ready! when the kit will be ready? Hi, Carole – Look for the availability announcement for the kits and the instructional ebook (separately) on November 23 around 7:00 am central here on Needle ‘n Thread. What a beautiful project! I’d be happy to pre-order a kit if that would help you and guarantee getting one. Hi, Madeleine – Thanks for your comment! I’m afraid I can’t do pre-orders or reservations. The kits will be available on a first-come basis when the announcement goes up on Friday, Nov. 23, around 7am central time, if you want to look for it then. As much as I’d like to do pre-orders, I have a policy about taking orders for items that are not immediately available to ship, given the relative uncertainty of the needlework industry when it comes to having threads available and ready from suppliers. I wouldn’t like taking orders and not being able to ship the product ordered immediately. As for reservations, I’ve done that in the past, and they don’t always work out. Hence, the first-come policy when putting together something like this. It’s just too much of an investment to take a risk either way – on your end, or my end! Absolutely love your tapestry smalls!! Your ebooks are so handy and to be able to have all the supplies available in a lot just makes it perfect. Can’t wait for both. This is just the kind of thing I like! I have never worked on silk gauze though. Is it a difficult fabric to work with? Hi, Gillian – Silk gauze is like working on tiny needlepoint canvas. If you’re familiar with working on canvas, then the experience is the same, but on a smaller scale. Otherwise, if you haven’t worked on canvas, but you have worked on even-weave linen doing any counted work, it’s very similar, but the “fabric” between the holes is really only the one thread that makes the grid. The holes are the big things and the fabric is tiny, if that makes any sense. You’re working over a grid just as you would with linen, but you’re crossing over just one little thread that forms the grid, and the holes themselves are bigger than that thread. If you imagine a piece of graph paper, and then picture the lines as the “fabric” fiber, and the white squares as the holes between the fibers, that’s what it’s like. Mary I love these! I’m particularly fond of the squirrels & the cat, and know JUST whom I would make these for. The best bit is that they are small, which means I could work on them without having to take over the room I’m in – they would even be a terrific traveling project, because I never go anywhere without a bit of handwork of some sort to do. Well done! Absolutely love these! Immediately thought they were pincushions… would be sooo pretty. I love the idea of them being kit form. I’ve needlepointed for years but never have tried something this small. Will they be available in time for Christmas giving? Hi, Penny – I’m launching the instructional ebook (containing the charts and stitching & finishing tips) and a limited number of kits on Friday, November 23. The e-book is a download, so you’d have the charts immediately after purchase. The kits will be mailed flat rate priority in the US. The availability announcement will be posted on the home of Needle ‘n Thread (here on the website) around 7:00 am that morning. Hope that helps! Like Sarah, I thought a kit would be wonderful. I have recently been working on large canvases and am so ready for something at the other end of the spectrum. Can’t wait for the kit! These little miniatures are lovely Mary. They would be great for dollhouse miniaturists to stitch. Many dollhouses (or dolls’ houses as we say in the UK) are Tudor or medieval based. Lots of collectors want the Lady and the Unicorn tapestries and these would be an excellent alternative to those people who cannot face stitching up a full tapestry. The round design could be squared off with a few extra flowers in the corners and they would make beautiful little tapestries for framing, hanging or even pillow/cushion covers. These look so lovely! Can you say what the price will be, even approximately (apologies if you have already said this – I did skim through the comments)? Hi, Dectora – I’m still crunching the numbers, trying to get down to the lowest possible price they can reasonably be. If you consider, though, the 15 spools of silk (3 Soie Gobelins and 12 Soie de Paris) and calculate the retail cost of those – (about $69) – that will give you an initial ball park figure. The other items in the kit, packaging, etc will increase the cost somewhat. I will make them into Christmas ornaments as gifts. Please let me know when the chart is available. Hi, Donna – the charts and kit will be available Friday, November 23. I’m launching them around 7:00 am here on Needle ‘n Thread – just visit the home page to see the announcement. There will be links to the products in my shop. Love the look of these. So little and sweet. I tried a Santa on the silk. Kept making mistakes. Tent stitch did not look right. Any suggestions. Just catching up on your blog today and absolutely fell in love with your smalls! I do hope you will market enough of these for your millions of devotees (including me!) and to plump your bank account (your work is and will always be worth $$$!). Thank you for the inspiration, encouragement, and knowledge you pack into your blog! I love kits. Finding supplies for a project can be difficult if you have to buy each thing individually, especially if you don’t live near a good needlework shop. Kits are so convenient. Would love to see a deer! Me, too, Donna – large buttons! I think one would look great attached to the cuff of a slouchy knitted winter hat – or a felted beret or something similar. Or holding a knitted cowl closed… hmmmm. Lots of ideas! First of all, I hope you feel better. I love these little projects. When the kits will be ready I will for sure buy one from you. Thanks, Genevieve! I’m doing pretty well these days. I’m glad you love the smalls – I love ’em, too! 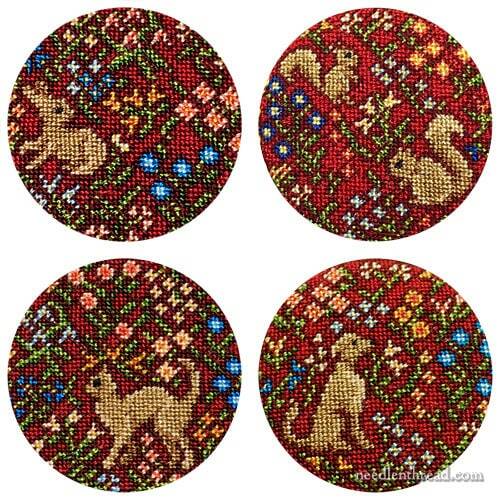 Hi Mary, I am very interested in learning how to stitch these adorable tapestry smalls. I am aware of the tiny gauged silk backgrounds, but did not have the know how to find the right pattern and materials. A kit would solve all my problems of delving into an entirely new arena starting off with the correct materials. Please sign me up for one of these kits when available. I will gladly prepay to hold one of these kits. I would love to know how to do this, and with your guidance I feel very confident of a victory instead of an unfinished disappointed project. Hi, Cindy! The kits and e-book will launch on Friday morning, November 23, about 7AM central time, with an availability announcement here on the home page of Needle ‘n Thread. Right now, I have a limited number of kits to offer. If the demand and interest is there, I’ll holefully be able to do another run. I’m not taking pre-orders or holding reservations, as these can cause too many complications. Thanks for your enthusiasm – the projects are a lot of fun! I’ll do my best to accommodate everyone who wants a kit, even if I can’t get them all out in this first run. Hi Mary. These look beautiful. I’ve seen several people mention counted cross stitch. Are these a cross stitch? I thought they were more like needle point. Basically a tent stitch. What should I expect? Looks interesting! Never done anything so small so will wait to see the kit! Thanks for all your hard work. A Happy and Blessed Thanksgiving to you and yours! I love the kit idea. I was taught embroidery by my grandmother but had not done any for almost 30 years. Due to a surgery a several months ago I was limited in using my left shoulder and told I couldn’t sew or knit. This drove me nuts as always make things for my grandchildern for Christmas. I figured why not embroidery as it had limited shoulder movement for my left arm. Starting embroidery again after all these years I needed a little refreshing of my memories and your site has been perfect for this. As well as helping me renew my abilities, a couple of my grandchildern have asked to be taught and it is assisting me in sharing embroidery with them. As I have been teaching them I have put together little kits for each project to ensure they have the proper supplies to complete the group project and begin to build a bit of a stash to do independent projects. Your kits sound perfect for us! I can’t wait to show them to the girls. They also sound like great Christmas gifts. Thank you for all the hard work you put into your site.